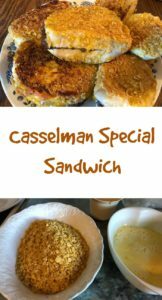 The Casselman Special sandwich is a favorite of mine. I grew up in the Casselman Valley of western Maryland and Pennsylvania. This geographic area consists mainly of the corridor of the Casselman River stretching from the river’s headwaters near Bittinger, Maryland, to Meyersdale, Pennsylvania. The Casselman River is a winding river. As kids, we swam in its waters, and my siblings and cousins spent hours fishing there. The Casselman River is a 56.5-mile-long (90.9 km) tributary of the Youghiogheny River in western Maryland and Pennsylvania. Many businesses and organizations use the name “Casselman” in the title. One business which includes a restaurant and motel (owned by my family members) is called The Casselman Inn and Restaurant. The Inn and Restaurant, located on main street in Grantsville, has always been special to my family. Purchased in 1963 by my uncle and aunt, it changed hands in 2017 but remains in the my Miller family today. It’s a great place to visit and to stay. To visit their website, click here. I paid my way through college by working as a waitress there, and one of the items on the menu then was the sandwich named Casselman Special. The restaurant also has a Casselman Special with Hamburger. 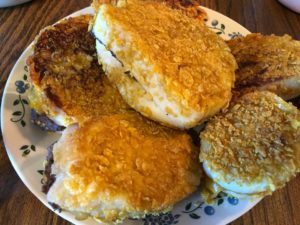 These sandwiches are still on the menu over half a century later, so you know they’re good. 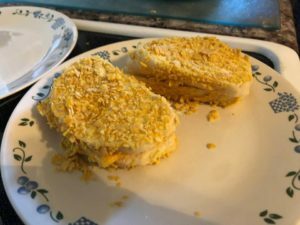 The Casselman Special is a cheese sandwich spread with mayonnaise, dipped in an egg mixture, breaded and deep-fat-fried. The Special with hamburger has a fried hamburger inside. I have sisters who continued making this sandwich in their homes long after their years of working at this restaurant. Last week I visited my sister Loretta in Nebraska, and we munched on these sandwiches, feeling nostalgic once again. You can use any type of bread you want, but homemade is certainly the best. For this sandwich, Loretta used her homemade French bread. The hamburger is fried into a thin piece and cut just the right size for the bread. 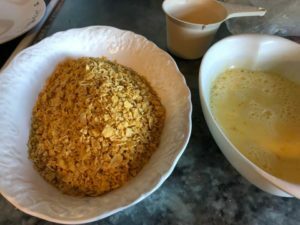 For breading, she used cornflakes rolled into pieces using a rolling pin. You can use a blender if you want to make it finer. You can choose other breading if you prefer. For the egg mixture, you’ll need just enough to dip your sandwiches into before frying them. For six sandwiches, you’ll need 2 eggs and 1/4 cup milk. You can deep-fat fry these, or just put a little oil in a skillet and brown them until done. I suppose you could call this a combination of a grilled cheese and French toast sandwich. Or just call it a Casselman Special! An easy sandwich with a different twist. 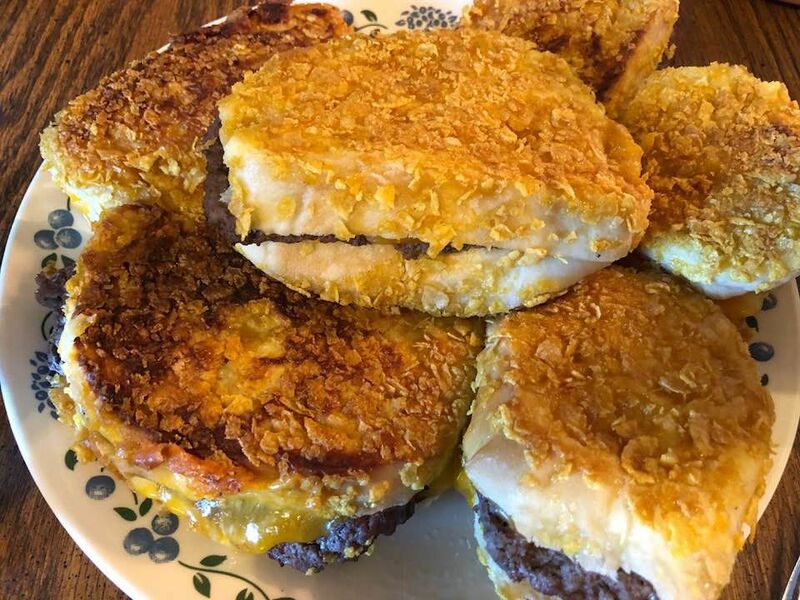 Make it with or without a hamburger tucked inside.